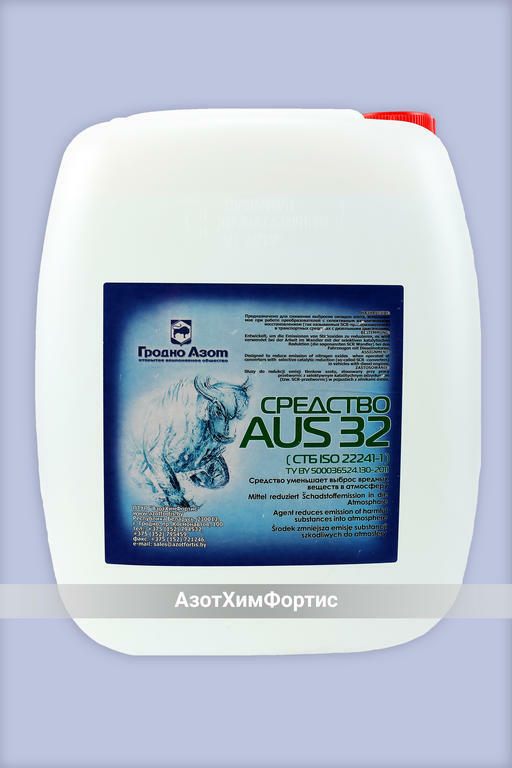 “AzotKhimFortis” UE produces complete analogue of AdBlue® (reagent for diesel motors) — reagent AUS 32. Our product is a high-qualitative reagent, that is a solution of carbamide of high purification (concentration of active substance is 32,5 %) in demineralized water— it is a superpure reagent for reduction of nitrogen oxides of NOx type for diesel motors of standards EURO-4, EURO-5 and EURO-6, equipped with technology SCR (selective catalytic reagent). Guaranteed quality – production and transportation of the goods are strictly regulated by international standard ISO 22241, ТU BY 591020810.001-2016 For each lot of the shipped goods there is provided quality certificate by 19 parameters, which are completely meet licensed product AdBlue®. Economy of funds – average cost is 30-40% less than that of AdBlue®. We successfully co-operate with enterprises of machine-building complex of the Republic, transportation organizations, bus fleets, retail network of gas filling stations of RUE PA “Belorusneft”, using the liquid for the first filling and as a technical liquid inclusively for retail sale.